The bathroom is in and I think we are now rid of dust, so painting should resume soonish. 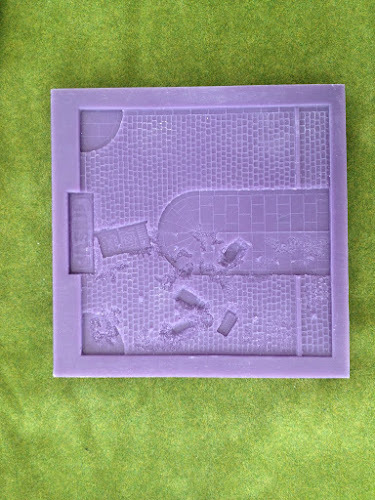 I have a few items that are being painted for our SELWG game in October, starting with one of those mystery terrain pieces I posted about a couple of weeks back. Here's another photo to whet the appetite. The terrain pieces are simple bases for my dark age Anglo Saxon buildings. This building is a church manufactured by Adrian's Wall. 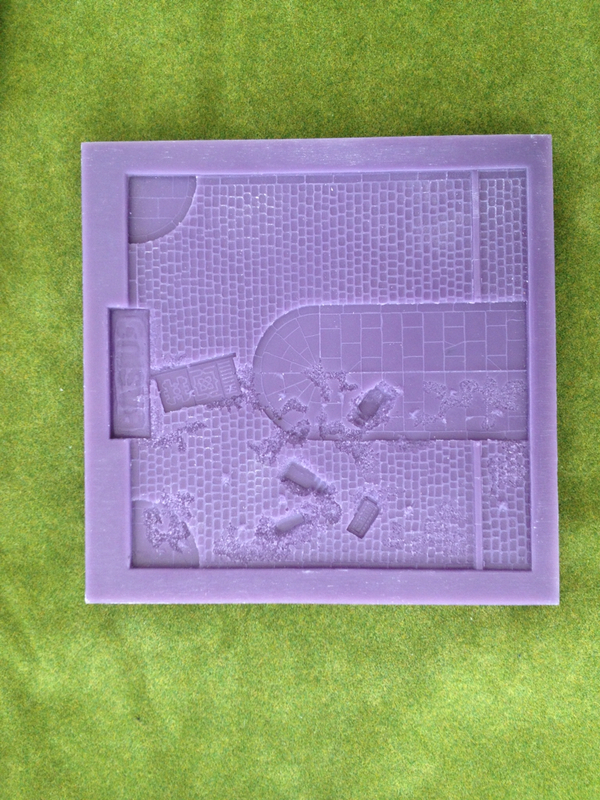 I cut the base so it provides a space of VS between the building and the terrain edge. 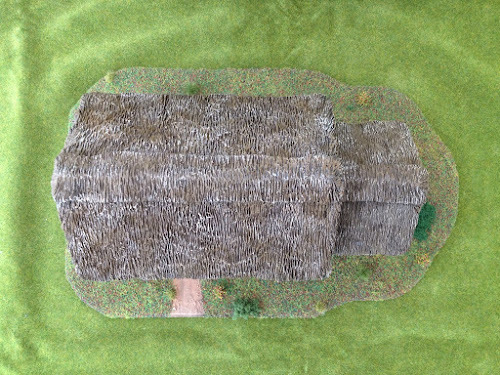 Although I'll no doubt use the bases in games such as Lion Rampant, in SAGA they provide a useful visual guide to permitted movement areas. I didn't go too mad with extra scenery items on the bases so figures can be placed. 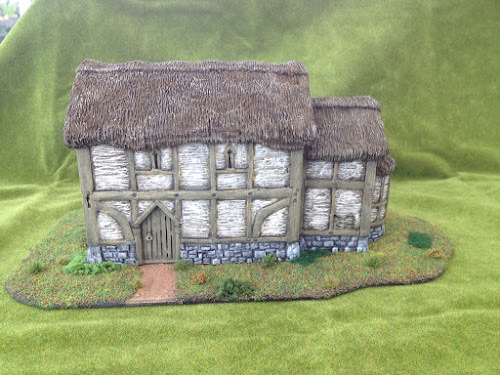 However, for our Back to the Longship game in October I'm painting up some loose items that can be placed as needed (tables, benches etc). More on that another time, still lots to make and paint. In the meantime another Kickstarter project arrived today. 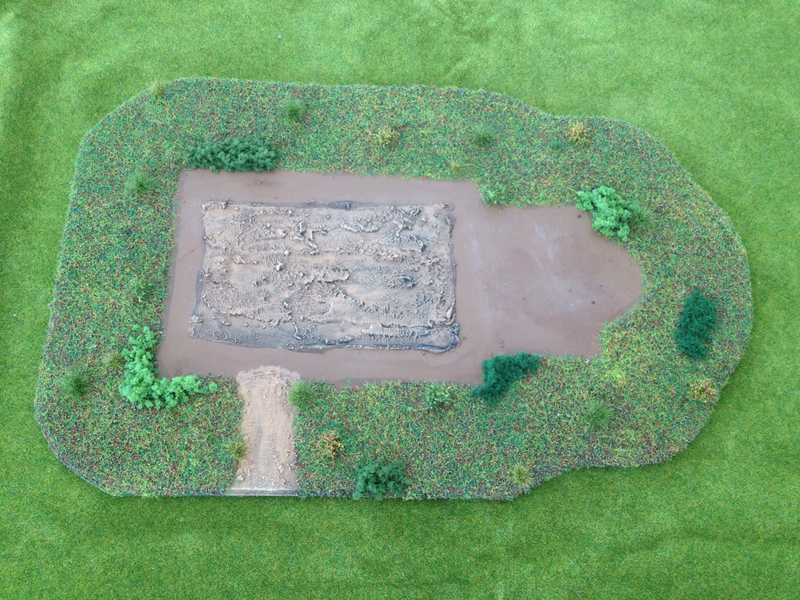 These are Basius 2 pads that are used to make scatter terrain and figure bases. 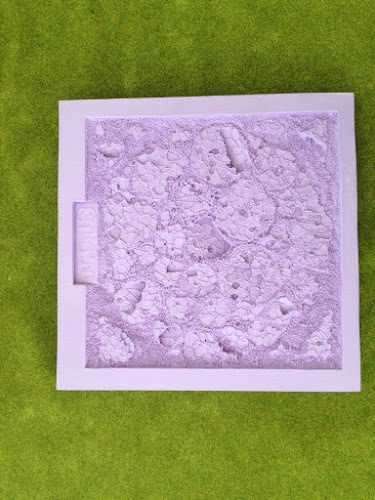 Green stuff is squashed into the base and when pulled off has the imprint of the terrain. 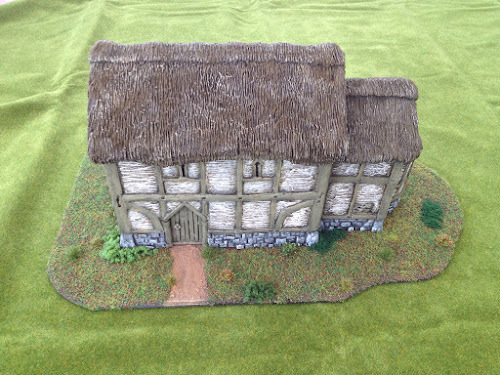 I ordered Imperial and Victoriana to make stone floors and cobbles etc. I'll post up some pictures once I've had a go with them. The builders should be finished today (Monday), so hopefully the Battle of the Dust will soon be at an end. 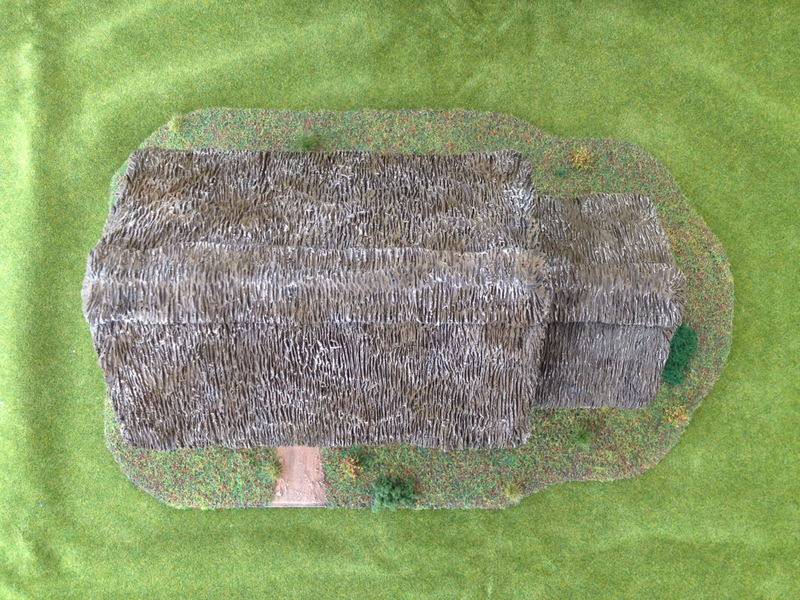 During the build I've tried to keep up with painting, but concentrated more on terrain for various scenarios. I'll try to get a few photos up later in the week. One of my Kickstarter pledges arrived last week, but remained unopened due to our state of chaos. Well yesterday I took off the wraps so we could give The Great War a go! 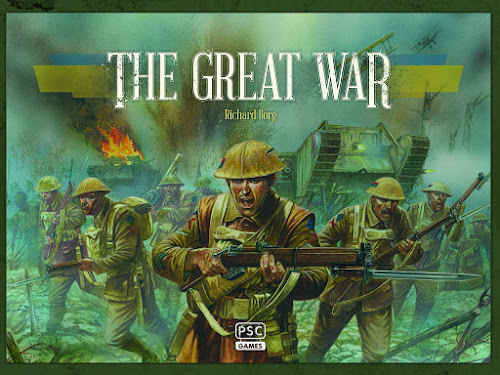 Published by Plastic Soldier Company and based on Command and Colours, The Great War is a board game with a relatively easy to learn and streamlined rule system that uses both cards and dice. The cards allow you to give orders to your units and introduce an element of uncertainty into what can be achieved. Dice are used to resolve attacks. The game plays very nicely and we are looking forward to working our way through the various historical scenarios. If you are intending to buy the game though, a word of warning. Rather than the wooden blocks and stickers used by other games in the series, The Great War uses plastic models to represent troops. These look great, but cutting the British troops from their sprues was quite a time consuming experience... Not only that but several bayonets were broken in the process. I managed to glue all but one, but still... Looking at the Kickstarter page, it appears many other people experienced the same frustration.